Being Polish, one flavor that always strikes me as the holidays is kielbasa. My grandmother always serves up kielbasa around holidays, but the from-the-butcher kind that tastes so amazing relative to the mass produced kind. 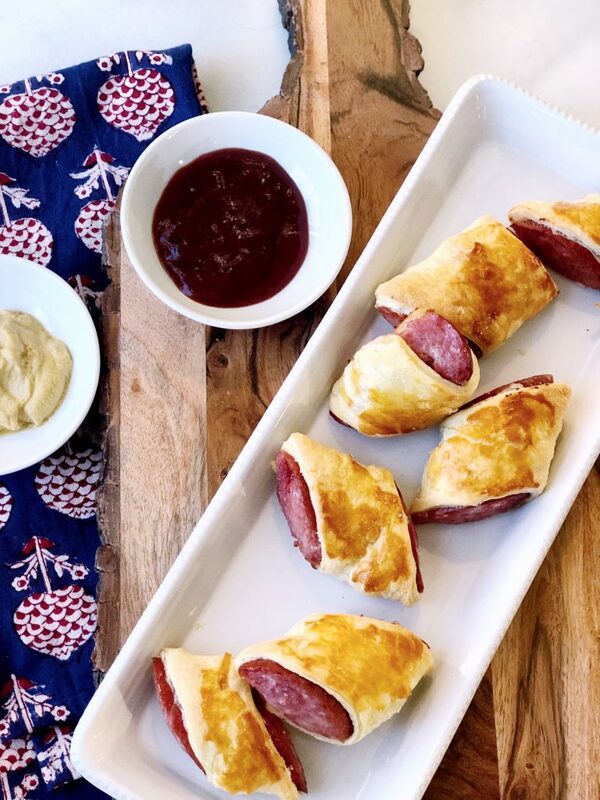 So for this pigs in a blanket appetizer recipe, I encourage you to find a butcher that sells Polish kielbasa, and if you’re in the NJ-CT-NY area, get Rapacki! We recently hosted a cocktail party before leaving for our New Years trip to Paris (!!! ), and these were such a hit! You know I’m all about any opportunity to graze and these are delightful. 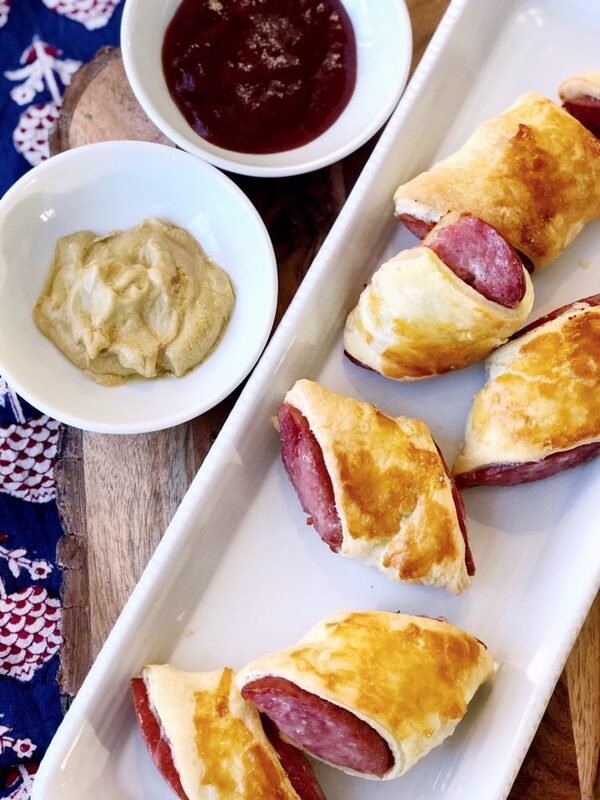 The puff pastry adds a sweet crunch to the salty, savory kielbasa. Plus, they bake quickly (once your pastry is defrosted) and reheat well! Serve these up with your favorite hot dog toppings, or dress up your ketchup with plum jam, as I did for our party. I also added a little horseradish on the side, a little game time decision. Speaking of game time decisions, these would be a great recipe for your super bowl party! 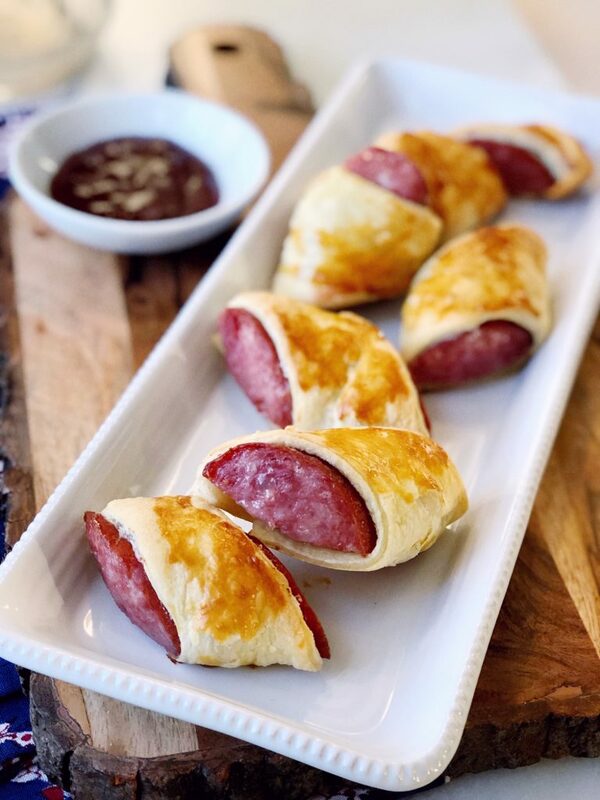 These are a twist on the classic pigs in a blanket, feeling just a tad dressier for a cocktail party. Dust a rolling surface with flour and your rolling pin. Gently roll the puff pastry to be nearly double in size. 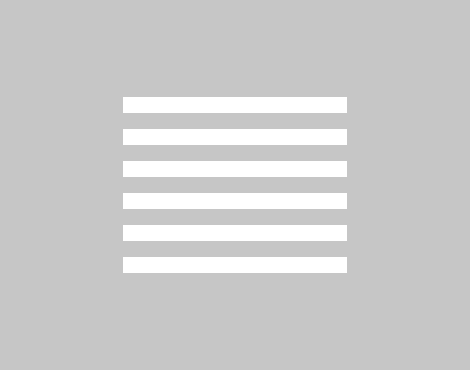 Cut your pastry sheet into 9 rectangles. Cut your kielbasa in half, placing each long piece on the left side of the rectangle. Brush your beaten egg on the exposed pastry and roll the kielbasa and pastry as you would a traditional pig in blanket. The egg creates a seal. Repeat with all rectangles. Place in the refrigerator at least 30 minutes. Meanwhile, preheat oven to 425.
remove from the refrigerator and brush the kielbasa with egg wash.
Place in the oven for 25-30 minutes or until golden brown. Rest for 5 minutes and slice on a bias.